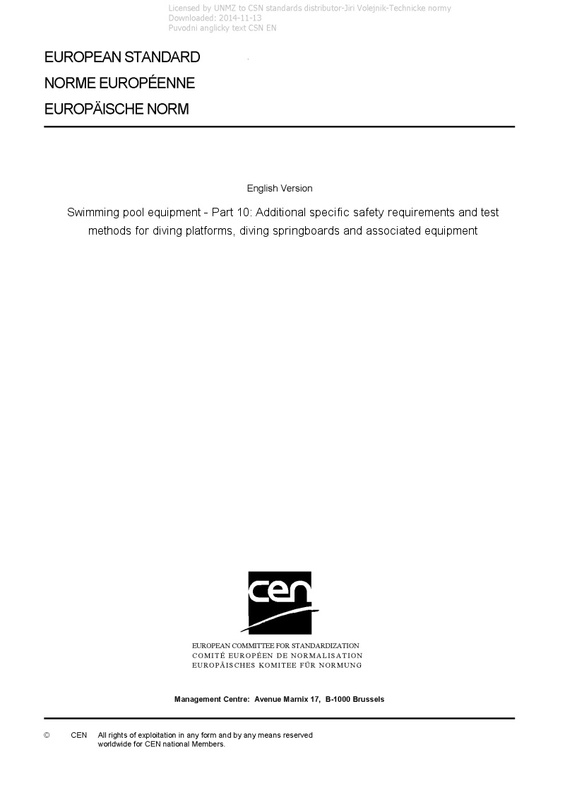 EN 13451-10 Swimming pool equipment - Part 10: Additional specific safety requirements and test methods for diving platforms, diving springboards and associated equipment - This part of the EN 13451 series specifies safety requirements for diving platforms, diving springboards and associated equipment in addition to the general safety requirements of EN 13451-1 and is meant to be read in conjunction with it. The requirements of this part of the EN 13451 series take priority over those in EN 13451-1. This part of the EN 13451 series is applicable to platforms and springboards, and associated equipment for use in classified swimming pools as specified in EN 15288-1 and EN 15288-2.